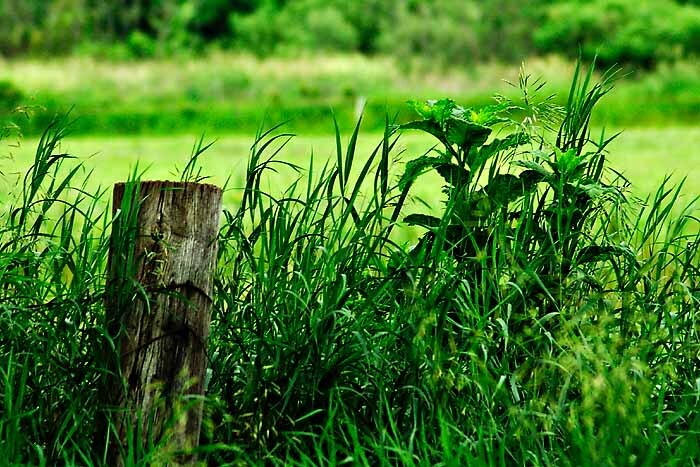 I shot this fencepost nearly two months ago -- and it was one of several shots I hadn't intended to take at all. Which is not to say I didn't want to take it; I merely hadn't meant to. Yes, there's a (not so short) story that goes with that: I was driving with Weez out in the direction of what's now our home a week or so before we were scheduled to get the keys. We wanted to look at it - you know how it is. And as we passed this post, I noticed (at 50+ mph) that there was a hedgehog sitting atop it. I mentioned it to Weez and she gave me one of those, Yeah, right! looks. So I turned around and went back and he was gone. I shrugged and drove on and turned around again to continue the original journey to the new place. Well, when we passed it the third time, there he was again -- and we BOTH saw him! Yep ... I had to turn around again (you gotta believe Weez is patient with me, folks!) and go back to see if I could get his picture. Well .. he was gone again. So I pulled off onto the shoulder and we waited for a few minutes just in case he'd gone for a snack or coffee or to piddle or something. And while we waited, I took the camera and changed to the long lens (70-300mm telephoto/zoom) and took a couple of test shots to make sure I'd be ready when he came back. Which he didn't do. But I did get this shot of a pretty cool old fencepost and I figure why not make lemonade from that lemon ... ya know? Oh ... and if you hadn't (or even if you had) noticed the comments link up there, there's a comments link up there. Feel free to use it.